Over the past ten years, we witnessed a very unbalanced development in the global solar cells sector. China rapidly expanded its production capacity, and could therefore use the latest technology and reap economies of scale. But in the end, this led to excess capacity and a price collapse. Good for the consumer but bad for industry and for innovation. And for Europe and the US, the big question is now: do we have to cede this highly technological sector to China as well? For many European stakeholders, recent developments on the solar cells market have been a wake-up call, says ECN’s Wim Sinke, when asked this question. Solar energy will become very big indeed – and how can Europe and the US retain a major share of added value in the chain? How do we prevent a new kind of energy dependence? According to Sinke, there is no reason per se why solar cells could not be produced in Europe or the US. In other words, low wages have not been decisive in China’s recent dominance on the market. New studies show that added value can be more evenly distributed. The EU and the US will have to exert themselves to the utmost, but we will have to do it. Important prerequisites, apart from using the best technologies available, are an efficient supply chain, large-scale production, good business conditions and the availability of capital. In addition to that, a global level playing field in terms of quality requirements and environmental regulation is of major importance. In temperate climatological regions, policy makers underestimate the potential of solar cells, says Sinke. Many policy makers seem to think that these countries should concentrate on wind power, and that solar cells should be reserved for sunnier climates. For instance, in the recent Dutch National Energy Agreement, the target for the contribution of solar cells is somewhat ‘hidden’; moreover, the true potential is not recognised. 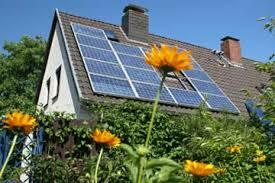 Another misunderstanding is that solar energy would require major areas of land. But a global energy supply, based on efficient solar cells, will require less space than our present energy system, taking into account all areas used. Like open pit mines, surface for growing biomass, areas in use for pipelines, etc. The Netherlands and other densely populated countries have additional requirements, because of their fierce competition for space. Therefore, they need solar cells with high efficiencies; 40% or higher would be perfect, says Sinke. Whereas land-saving high efficiencies could be less important in other parts of the world. In the Netherlands, solar energy will predominantly be produced in towns and on infrastructural works; that will require compact installations and multiple use of space. Silicon-based panels can still be developed a lot further, says Sinke. Their production costs fall each year, and their market share has increased again over the past five years, from 85% to over 90%. If they are properly redesigned, the efficiency of commercial solar panels can increase from some 16-22% now, to 25% in 2020. That is stiff competition for their competitors, thin-film solar cells. The next step might be that we cover the best crystalline silicon-based cells with appropriate thin-film cells, which could produce 30+% efficiencies. Sinke does not see a limit to this development yet; all the time, science and technology come up with innovations that enhance the efficiencies of solar cells, reduce costs and improve sustainability. In addition to that, the price of silicon keeps falling, and solar cells need increasingly less of it; therefore, the cost of silicon falls as a proportion of total panel or system costs. Silicon now costs some 20 Euros per kilogram. That equals the price of good cheese, and it is just 10% of the price in the hike just a few years ago, when there was a temporary shortage of pure silicon, says Sinke. 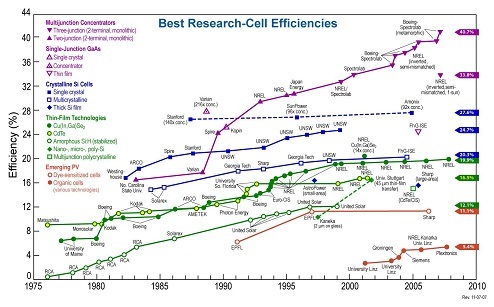 Summing up, the battle between different technologies for solar cells is by far not over yet. Unmistakably, Europe is one of the major suppliers of knowledge and technology in this area. With a major effort, our continent can reclaim part of the lost production of solar cells and solar panels. That would be good for our economy, and for the construction of a truly sustainable energy system.